On the menu, carrot cake, made from scratch, with locally grown English walnuts and a homemade vanilla cream cheese frosting! Yummmm. Though, as I was prepping my Mise en Place, yet another teachable moment presents itself…how to peel a carrot. Everybody knows how to peel a carrot. Right? Long strokes of a potato peeler, along the length of the carrot, away from you. Chef Husband nevertheless understands the limitations of time and the essentials of efficiency, and he offers to prep the carrots for my dessert in process. What I come to learn is that because a swivel peeler has two blades, it can be used in both directions. 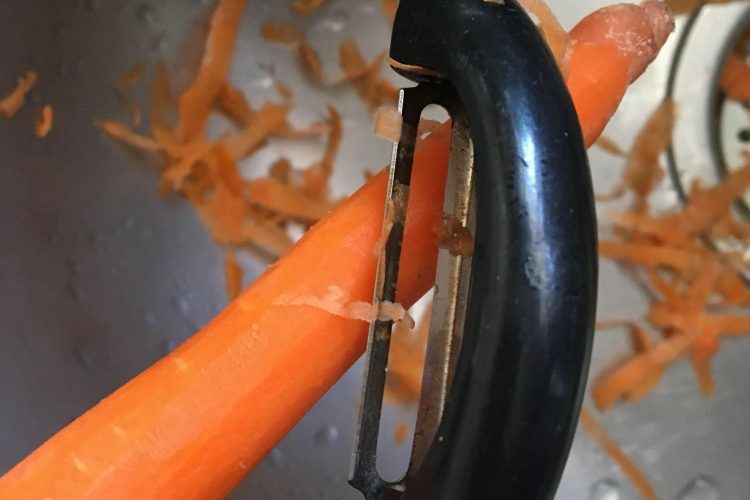 Chef Husband’s technique utilizes this feature, peeling back and forth with short, quick strokes, as if he were “scrubbing” the peel off the carrot. Short light strokes, back and forth, back and forth, scrub, scrub, scrub. Later, I then successfully used this same technique to work on peeling the stems of some broccoli (for another endeavor, not the carrot cake). Hello Fourk Restaurant in North Carolina! Thank you so much for visiting us from all the way over on the east coast. We appreciate your feedback. Yes! Pictures and videos are on the way. We just moved over from Blogger, which is opening up doors for us to have a lot more creative freedom. Your menu looks amazing. Love the beautiful picture of the scallops on the home page. Looking forward to you being a part of our journey.